"At TribFest, Perry Says He Still Supports Tuition Law" was first published by The Texas Tribune, a nonprofit, nonpartisan media organization that informs Texans — and engages with them — about public policy, politics, government and statewide issues. As he considers a second run for president, Gov. Rick Perry said Sunday that he continues to support a Texas program that proved a political liability during his failed 2012 bid. “That was probably a poor use of the term,” Perry told Tribune CEO and Editor-in-Chief Evan Smith. Perry, who will leave the governor's office in January, acknowledged that some Republicans in the Texas Legislature intend to repeal the program in the next legislative session. But he said the reasons that lawmakers supported the idea 13 years ago still stand today. “Economically, what was in the best interest in the state of Texas was to give these young people the opportunity to be givers rather than takers, to be a constructive part of this society,” Perry said. Perry said he would not decide whether he was going to run for president until 2015, but he added that he is doing everything needed to be ready and avoid the mistakes of his first attempt. Smith began the interview asking Perry about the federal indictment against him related to his efforts to see Travis County District Attorney Rosemary Lehmberg resign following a drunken driving arrest. Perry described the issue as in the hands of his lawyers and refused to answer any questions on it. “I would tell you that it’s already been addressed, and I’m not going to be adding anything new to it,” Perry said. Smith asked what if he just spent the rest of the interview in silence waiting for Perry to talk about the indictments. It was one of several laugh lines a relaxed Perry drew from the festival crowd. When Smith asked Perry to name “one or two or three things” he wishes he could do over during his tenure as governor, Perry quipped, “Three’s a bit of a stretch to me,” a reference to an infamous 2011 presidential debate in which he forgot one of the three federal agencies he supported eliminating. He added that the choice to try to force the issue with an “executive order” was wrong, saying Texans aren’t “real big executive order types.” A day earlier, Democratic gubernatorial candidate Wendy Davis told Smith at the Tribune Festival that, if elected, she may expand Medicaid through an executive order. As Smith questioned Perry about how he believes his legacy as governor will be, Perry pointed most often to the state’s economic success. 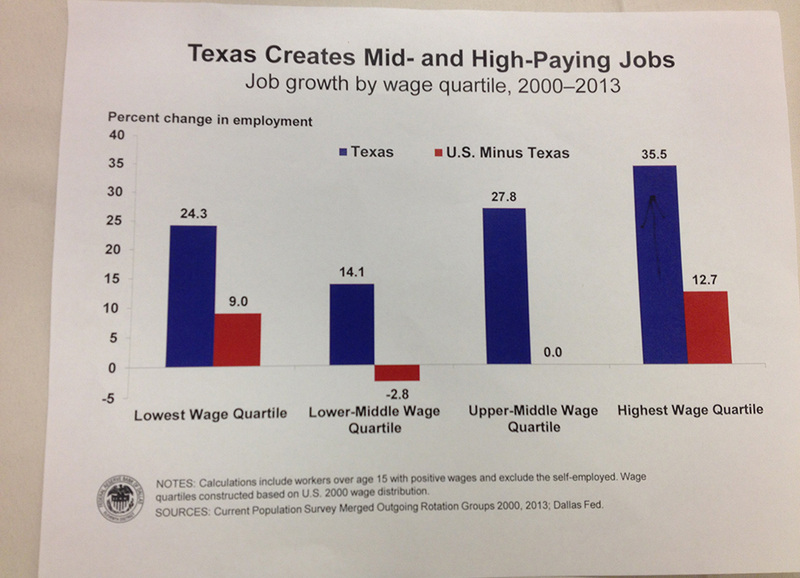 In response to criticism that too much of Texas’ job growth has been in minimum-wage jobs, he presented piece of paper with a bar chart highlighting data from the Federal Reserve Bank of Dallas comparing the percentage growth in jobs of the Texas and U.S. economy by wage quartile. At The Texas Tribune Festival on Sunday, Gov. Rick Perry cited this Federal Reserve Bank of Dallas chart to illustrate Texas' economic performance. Perry gave a less forceful defense of his use of economic incentives throughout his tenure as governor. While insisting that the programs have contributed to the state’s economic success, he expressed comfort with calls by lawmakers and candidates to re-examine them in next year’s legislative session. During an audience Q&A portion of the interview, Perry was asked about the controversial bill he signed last year implementing new standards on clinics that perform abortions, including requiring them to meet the standards of an ambulatory surgical centers, such as having minimum sizes for rooms and doorways and having pipelines for anesthesia. Perry responded by pointing to the recent death of comedian Joan Rivers. Rivers died at the age of 81 on Sept. 4 at a hospital, a week after she visited a New York clinic called Yorkville Endoscopy for a minor procedure on her vocal cords and went into cardiac arrest. Yorkville Endoscopy is an ambulatory surgical center, according to Bloomberg. However, state officials are investigating whether the facility violated any of the state’s rules in Rivers’ case. During a portion of the interview focused on education, Perry rejected criticism of the state’s performance on public education based on per-student spending. Instead, he pointed to statistics like an increase in higher education participation among Hispanics. “It’s the young men and women’s lives who have been changed forever because we have helped them access and have the ability to afford going to an institution of higher learning,” Perry said. When Smith offered less favorable statistics looking at high school dropouts, Perry said the proper focus was on how the state has improved overall on education performance. “If that’s the only thing you look at, you might be on to something, but I would suggest to you that’s not the only thing you look at,” Perry said. Asked about controversy surrounding University of Texas System Regent Wallace Hall, Perry argued that legislators shouldn’t pursue impeachment hearings. A legislative committee voted to censure Hall this year as part of an investigation that focused on his lengthy personal investigations of the University of Texas at Austin administration and his subsequent handling of private student information. Hall, who was appointed to the board by Perry, has denied accusations of wrongdoing, saying his efforts have satisfied the oversight responsibilities of his position. Some of Hall's inquiries have triggered inquiries and policy changes. On Sunday, Perry argued that if lawmakers pursued impeachment hearings, they would raise questions about whether they were violating the state’s separation of powers rule. Perry added that unforeseen events would largely dictate the next governor’s actions, just as it had for Perry, citing the explosion of the Columbia space shuttle over Texas as an example. “You’re defined by events that you’ll never see coming,” Perry said. At TribFest, Perry Says He Still Supports Tuition Law By Aman Batheja September 21, 2014 As he considers a second run for president, Gov. Rick Perry said Sunday that he continues to support a Texas program that proved a political liability during his failed 2012 bid. Perry said during a one-hour interview at The Texas Tribune Festival that he still supports a Texas law that grants in-state tuition to undocumented immigrants. However, he expressed regret for having said in a 2011 debate that he questioned whether those who do support the program don’t “have a heart.” “That was probably a poor use of the term,” Perry told Tribune CEO and Editor-in-Chief Evan Smith. Asked how he would handle the issue if it came up again, he added, “I wouldn’t say they were heartless. I would say I hope I can explain to you why in 2001 this was the right thing to do for the state of Texas.” Perry, who will leave the governor's office in January, acknowledged that some Republicans in the Texas Legislature intend to repeal the program in the next legislative session. But he said the reasons that lawmakers supported the idea 13 years ago still stand today. “Economically, what was in the best interest in the state of Texas was to give these young people the opportunity to be givers rather than takers, to be a constructive part of this society,” Perry said. Perry also praised land commissioner candidate George P. Bush’s defense of the controversial program in a Tribune Festival interview on Friday. Bush said in the interview that the program is "a nominal cost for the state of Texas.” More broadly, Perry called his decision this year to send Texas National Guard and law enforcement to the Texas-Mexico border “one of the biggest issues that I’ve engaged with possibly in my entire political career.” Perry said he would not decide whether he was going to run for president until 2015, but he added that he is doing everything needed to be ready and avoid the mistakes of his first attempt. “I was not prepared, and it was obvious,” Perry said. “And the preparation part of this takes years.” Smith began the interview asking Perry about the federal indictment against him related to his efforts to see Travis County District Attorney Rosemary Lehmberg resign following a drunken driving arrest. Perry described the issue as in the hands of his lawyers and refused to answer any questions on it. “I would tell you that it’s already been addressed, and I’m not going to be adding anything new to it,” Perry said. Smith asked what if he just spent the rest of the interview in silence waiting for Perry to talk about the indictments. “It’ll be a long hour,” Perry said, drawing laughs. “I had a date like that once.” It was one of several laugh lines a relaxed Perry drew from the festival crowd. When Smith asked Perry to name “one or two or three things” he wishes he could do over during his tenure as governor, Perry quipped, “Three’s a bit of a stretch to me,” a reference to an infamous 2011 presidential debate in which he forgot one of the three federal agencies he supported eliminating. Also in response to something he would do differently, Perry pointed to his 2007 attempt to require girls to be vaccinated against the human papillomavirus (HPV), a common sexually transmitted disease that can cause cervical cancer. Perry said he may have had “my heart in the right place, may have not had my head in the right place.” “I would have engaged the public,” Perry said. “I thought the public understood the importance of this from a standpoint of a cancer that’s taken lives from young women” He added that the choice to try to force the issue with an “executive order” was wrong, saying Texans aren’t “real big executive order types.” A day earlier, Democratic gubernatorial candidate Wendy Davis told Smith at the Tribune Festival that, if elected, she may expand Medicaid through an executive order. As Smith questioned Perry about how he believes his legacy as governor will be, Perry pointed most often to the state’s economic success. In response to criticism that too much of Texas’ job growth has been in minimum-wage jobs, he presented piece of paper with a bar chart highlighting data from the Federal Reserve Bank of Dallas comparing the percentage growth in jobs of the Texas and U.S. economy by wage quartile. Enlarge At The Texas Tribune Festival on Sunday, Gov. Rick Perry cited this Federal Reserve Bank of Dallas chart to illustrate Texas' economic performance. Perry gave a less forceful defense of his use of economic incentives throughout his tenure as governor. While insisting that the programs have contributed to the state’s economic success, he expressed comfort with calls by lawmakers and candidates to re-examine them in next year’s legislative session. “Do these incentive questions need to go on in perpetuity? I would suggest to you it’s a good conversation to have,” Perry said. He added later, “I think if they want to change it, if they want to unilaterally get out of the economic incentive business, that’s their call.” During an audience Q&A; portion of the interview, Perry was asked about the controversial bill he signed last year implementing new standards on clinics that perform abortions, including requiring them to meet the standards of an ambulatory surgical centers, such as having minimum sizes for rooms and doorways and having pipelines for anesthesia. Perry responded by pointing to the recent death of comedian Joan Rivers. “When Joan Rivers, in the procedure she had done and she died, that was a clinic,” Perry said. “It’s a curious thought if they had that procedure in place, that individual would still be alive.” Rivers died at the age of 81 on Sept. 4 at a hospital, a week after she visited a New York clinic called Yorkville Endoscopy for a minor procedure on her vocal cords and went into cardiac arrest. Yorkville Endoscopy is an ambulatory surgical center, according to Bloomberg. However, state officials are investigating whether the facility violated any of the state’s rules in Rivers’ case. During a portion of the interview focused on education, Perry rejected criticism of the state’s performance on public education based on per-student spending. “I think it’s simplistic to say you’re not spending enough money,” Perry said. “Not spending enough money compared to what? What’s the result?” Instead, he pointed to statistics like an increase in higher education participation among Hispanics. “It’s the young men and women’s lives who have been changed forever because we have helped them access and have the ability to afford going to an institution of higher learning,” Perry said. When Smith offered less favorable statistics looking at high school dropouts, Perry said the proper focus was on how the state has improved overall on education performance. “If that’s the only thing you look at, you might be on to something, but I would suggest to you that’s not the only thing you look at,” Perry said. Asked about controversy surrounding University of Texas System Regent Wallace Hall, Perry argued that legislators shouldn’t pursue impeachment hearings. A legislative committee voted to censure Hall this year as part of an investigation that focused on his lengthy personal investigations of the University of Texas at Austin administration and his subsequent handling of private student information. Hall, who was appointed to the board by Perry, has denied accusations of wrongdoing, saying his efforts have satisfied the oversight responsibilities of his position. Some of Hall's inquiries have triggered inquiries and policy changes. On Sunday, Perry argued that if lawmakers pursued impeachment hearings, they would raise questions about whether they were violating the state’s separation of powers rule. “I don’t think that’s particularly constructive,” Perry said. “I think that has been a distraction. Let the board of regents, let the board members they confirm do their job.” On the race to replace him in the Governor’s Mansion, Perry predicted Republican Attorney General Greg Abbott would win and turn out to be an “awesome” governor. He dismissed suggestions that Abbott will be completing “Perry’s fifth term.” “I think I heard that same thing about George Bush/Rick Perry,” Perry said. “We’re different people. I admire George W. greatly. I admire Greg Abbott greatly. But we’re different people. We’re going to have different focuses.” Perry added that unforeseen events would largely dictate the next governor’s actions, just as it had for Perry, citing the explosion of the Columbia space shuttle over Texas as an example. “You’re defined by events that you’ll never see coming,” Perry said. Disclosure: The University of Texas at Austin is a corporate sponsor of The Texas Tribune. A complete list of Texas Tribune donors and sponsors can be viewed here. "At TribFest, Perry Says He Still Supports Tuition Law" was first published at by The Texas Tribune, a nonprofit, nonpartisan media organization that informs Texans — and engages with them — about public policy, politics, government and statewide issues. Link back to the original article, which is located at https://www.texastribune.org/2014/09/21/perry-tribune-fest/.